What can you expect at Black Rock City? Make sure you are prepared for Burning Man Festival. This site is a collection of guides, how to tips, tricks and checklists to make sure you are ready for the greatest adventure of your life. This collection is made by fans and festival attendees. We are not affiliated with Burning Man Organization in any way. It is unlike any other Art Festival in the world. It takes a fair deal of preparation to party in an environment where NOTHING lives. Don't fool yourself! Burning Man is often a Dusty, Nasty, Freezing, Boiling, Dangerous environment. Make sure You Are Prepared. You came to the right place. This site is filled with tips for the most Amazing Adventure of Your Life. Follow the steps below. Can you sell a Burning Man Ticket if you can't attend? The Sandstorms at Burning Man can be intense. Make sure you have the proper protection, before you head off to The Playa. A good pair of goggles and desert scarf go a long way to making sure you don’t freak out. Listen to some tips from Old School Burners that have been to Burning Man more than a few times. Great tips! Burning Man safety and preparation tips, including weather, water, food, wind, self-reliance, dust, first aid and more. Burning Man preparation tips, including packing for self-reliance, bikes, art cars, MOOP, and leaving no trace. Burning Man preparation tips, including travel, transportation, exodus, ridesharing, foot protection, porta-potty etiquette, gray water disposal, oil drips, and kids at Burning Man. Burning Man is NOT a RAVE in THE DESERT. It’s the most amazing ART FESTIVAL in the world. It is made amazing because of the 10 principles. Make sure you understand the 10 Principles of Burning Man. Halcyon tells us more. Burning Man culture tips, including Black Rock City civics, community services, law enforcement, participation, decommodification, gifting, photography and boundaries (e.g. consent). Ebony gives a tour of her tent. She is super organized and clean, and shows some nice tips to keeping a tight tent. Burning Man Tips & Tricks #32 "BIKES"
Phoenix Firestarter of the Burning Man Playa Restoration crew talks about wood chips, why they're a nuisance and how to deal with them. 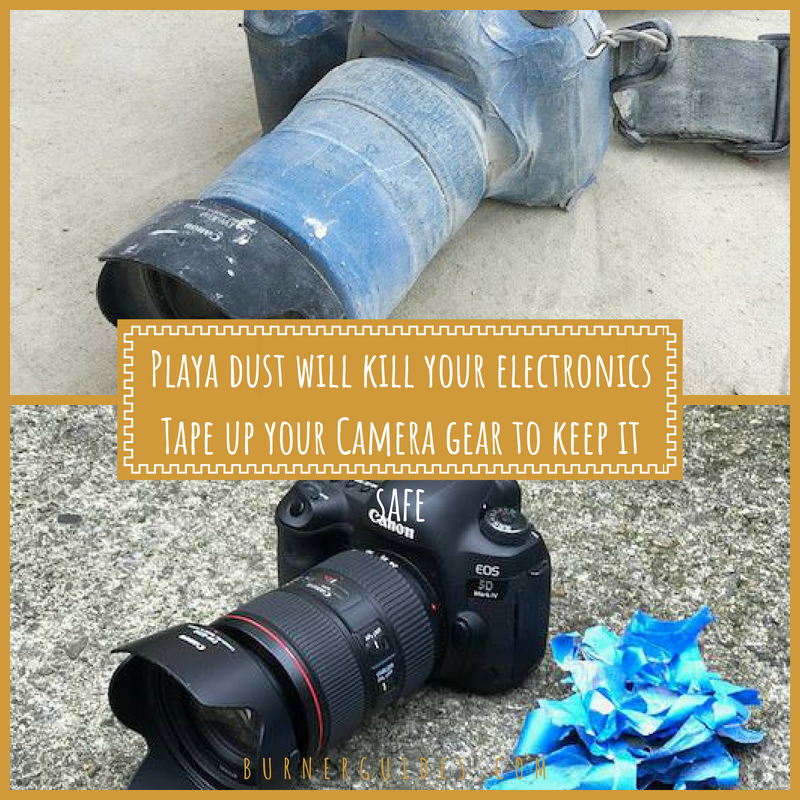 Use painter tape to protect your camera and electronics on the Playa. That dust is known to kill electronics, this at least helps battle that. Leave No Trace Public Service Announcements from the Black Rock City Department of Public Works: Playa Restoration! Anyone who has been to Burning Man before can tell you that it is an extremely harsh and challenging environment physically, emotionally, and culinarily! Come hear two veteran burners/culinary team members talk about the best ways to set up your Burning Man kitchen/food plan. You'll come away with some useful recipes and vital Burning Man tips & tricks. Who knows, you may even find your playa carpool buddy! Burning Man doesn’t have normal cars riding around. We’ve got Art Cars or AKA Mutant Vehicles. No regular cars are allowed on the playa, so if you don’t have some crazy car, either hitch a ride or ride your bike. Ignite is a documentary directed and produced by filmmaker Ryan Moore ("Manny narrated by Liam Neeson") featuring original score produced by the Grammy Award winning team behind "Mission Impossible: Fallout", "The Dark Knight" and "Inception". A cinematic experience into Burning Man, Ignite pays tribute to the community that builds this temporary desert world once each year. Download this handy checklist from Travelgrom to make sure you've got everything you need before you head out to The Playa. This is the official Survival Guide from Burning Man Organization. A MUST READ before you go. Make sure you know how to get to the Playa. A couple wrong turns in the Desert can lead to disaster.